You may be looking for the Wiki Arena. The Mirage Arena is a world featured in Kingdom Hearts Birth by Sleep, used specifically for the game's arena and multiplayer modes. Concept art of the Mirage Arena. The Mirage Arena was designed to be Kingdom Hearts Birth by Sleep's form of arena battles and multiplayer content, in contrast to previous forms of both elements in the Kingdom Hearts series. Previously, arena matches and long, seeded series of battles were conducted in Olympus Coliseum, and multiplayer was played through a special mode outside of the main game, such as Mission Mode. The Mirage Arena features the three protagonists, Terra, Ventus, and Aqua, in their armor in this world as well. To give the Mirage Arena's multiplayer and arena battles something that surpasses previous incarnations, new Unversed bosses were added to be exclusive to the Mirage Arena, and multiplayer can be more than just battling. Additionally, players can also race in Disney Town and play a board game on the Command Board. Concept art of the Mirage Arena shows that it was to be a flora-and-fauna-like hub in the sky instead of a hub in the middle of the Lanes Between. 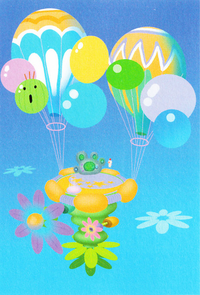 Balloons would have held up the hub instead of being a self-sustained space port, with one balloon having a similar appearance to a Cactuar. Originally, the Mirage Arena was meant to have a slight element of story to it, rather than be completely distant from any auxiliary characters. The developers planned for Laguna Loire from Final Fantasy VIII to appear in the Mirage Arena as the head of the arena. However, the team was also planning Dissidia 012 Final Fantasy at the same time, and decided that if Laguna appeared in Kingdom Hearts Birth by Sleep, he could not appear in Dissidia 012 Final Fantasy. The team eventually decided they would rather have Laguna appear in the latter, and so Laguna was ultimately left out of the final product. In an interview during E3 2014 on June 10, Tai Yasue said the Mirage Arena in the HD 2.5 ReMIX version Kingdom Hearts Birth by Sleep Final Mix would not have multiplayer capabilities. Additionally, Yasue said the Mirage Arena had been tweaked to be more enjoyable as a single-player arena. The Mirage Arena has a futuristic look that resembles that of Space Paranoids. The main area of the Mirage Arena is called the Hub (ロビー, Robī?, lit. "Lobby"). It appears as a large, mostly hollow, blue sphere floating in space. There are several small, flashing electrical towers on the outer surface, as well a very large version of the same type of tower and a thin, grey tower. At the bottom of the sphere is a grey, triangular shape, while at the top is a large, saucer-like structure with cables running underneath. The structure is surrounded by two concentric rings that constantly rotate about the sphere. The rings have circuitry running along the outer edge, and a pattern of triangles on the inner edge. There are also ghostly rings around the bottom of the sphere and another half-ring running around the center of the structure. The lobby is in the center of the sphere. In the center of the blue, tiled floor is a large, circular indentation with rings of neon lights. 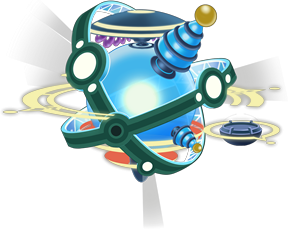 On one side is a circular transporter to the exit, and on the other side is a computer console and a Moogle that runs a Medal Shop. Hanging from the top of the sphere is a bulbous machine, projecting a sphere of moving light. Floating a distance from the large sphere is a hemispherical platform with a Save Point and a transporter to the lobby. The player enters and exits the Mirage Arena from this platform. While most events occur in different areas in other worlds, some Arena matches take place in a Battle Arena (アリーナ, Arīna?, lit. "Arena"), in which red screens of various shapes surround a circular field colored various shades of blue. The surrounding space can be seen through the windows in this area. A third area, also used for battle, places players in a room with a dark floor and walls. When entering the lobby, players have the option to play either over the Internet or offline. All events can be played online with multiple players, while all but Versus Mode can be played with one player. Once in the lobby, events can be selected from the console. A player connected to the Internet can choose to either host an event or join an existing one. Once all players have chosen to participate in an event, the event can begin once all players go to the center of the lobby and press followed by . Participating in events earns players Medals, which can be exchanged for Deck Commands and key items from the Moogle. Versus Mode: (Multiplayer only.) Players face each other in battle. Both team matches and free-for-all matches are available. Up to six players can participate with pre-made Command Decks, or up to three can play with their own Decks. Arena Mode: Players face off against rounds of enemies. Up to three players can participate. Command Board: Players face off in a Command Board game. Up to three players can participate. The host in a multiplayer game is free to choose the location of the boards. Rumble Racing: Players engage in a race in Disney Town aboard a Keyblade Glider. Up to six players can participate. As the player completes certain criteria in the Mirage Arena, they will gain Arena levels. Various benefits and rewards are allotted as a player's Arena level increases. [please confirm] Upon reaching certain levels, the Moogle Shop will have more items and more Arena matches available. The maximum Arena level is 30. Due to differences between the original and Final Mix versions of the game, the criteria are slightly different between the two versions. The medals the player earns can be freely traded to the Moogle for items. However, some items are only available after achieving a certain arena level, or getting to a certain point in the current character's save file. ↑ Nomura and Takahashi on Dissidia 012 Final Fantasy, Anoop Gantayat: "The FFVIII hero was actually supposed to have appeared in Kingdom Hearts Birth by Sleep, Nomura revealed. They'd even partially prepared a scenario where Laguna appears as the head of Mirage Arena. In the end, they decided that if they were to have a new character from FFVIII in Duodecim it would end up being Laguna, so they left him out of BbS." ↑ 3.0 3.1 Can only be bought in the NA, PAL, and Final Mix version. ↑ Can only be bought in the Final Mix version. This page was last edited on 2 April 2019, at 13:54.